Indian women have a thing for sarees. The charm of it, is never going to fade away from ethnic fashion. Even the storm of western outfits cannot uproot the love, a girl have for this 9 yards of beauty. 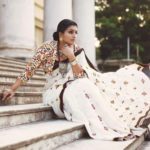 Just like any other fancy outfit in the fashion world, saree style have also evolved so much over the course of time. Still, few saree styles retains the test of time and stand tall. 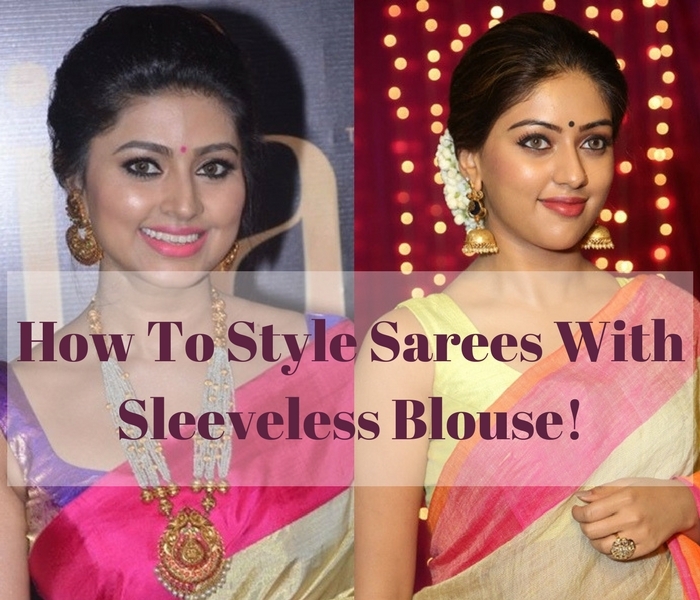 One such classic way to wear your sarees is with sleeveless blouse. This combination brings out the glam look of this traditional drapes and it is delightfully stylish. Thus, it has crowned huge popularity, not just today, but even on our mom’s time. 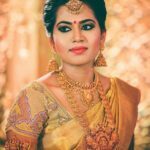 If you like to carry out this saree style with a grace today, then you can follow quite a few simple formulas to make it look wonderful on you. 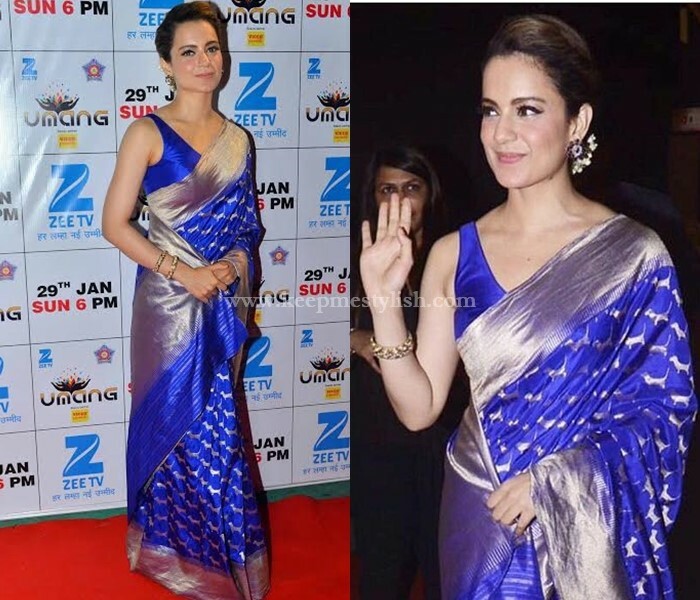 These easy styling tips can make you look like the celebs whom seems to flaunt this sarees style with such an ease. Believe us, most of the celebrity, be it Bollywood or our Tollywood divas for that matter, only adopt few basic things to put together an saree with an chic sleeveless blouse. That’s why we say you will get your dream celebs look if you care to take our ideas. Now scroll down and check out how the stylish girls in the celebrity world wears this gorgeous attire and take hints from them. The first rule in getting saree work with sleeveless blouse is to drape it perfectly and let the pallu float. Yes, this is the most appealing way to carry this style. Avoid pleating your saree over the shoulder and let the saree go free. 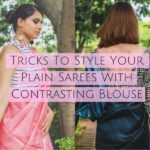 If you let your saree down over the shoulder, you will most likely hide your entire blouse except for the other shoulder area and the back neck. So keep this area as attractive as possible. Make your back necks dramatic and get some embellishment done on the shoulder area which is open to view. Even if you can’t find anything fancy, get your blouse on contrasting shades so it looks so inviting to your saree. For a saree with sleeveless blouse, hair bun will look incredibly beautiful. And those who fear it might make you look aged, then you are wrong. There are tons of stylish messy bun that can take your saree style to next level. Hence it is wise to go for a bun to add more edge to this look. We all know, how a simple dot on your forehead can add such a traditional element to your look. For this saree style, in fact, bindi does even more. It can make you look more magical. Don’t go for shimmery or very small bindi. Just go for a plain bold one, either in default shades of maroon, red or to the color that matches your saree. When you wear your saree with sleevless blouse, the attraction will be around your neck, face and upper bodice. So, you really need to choose wise accessories that speaks for your sarees. 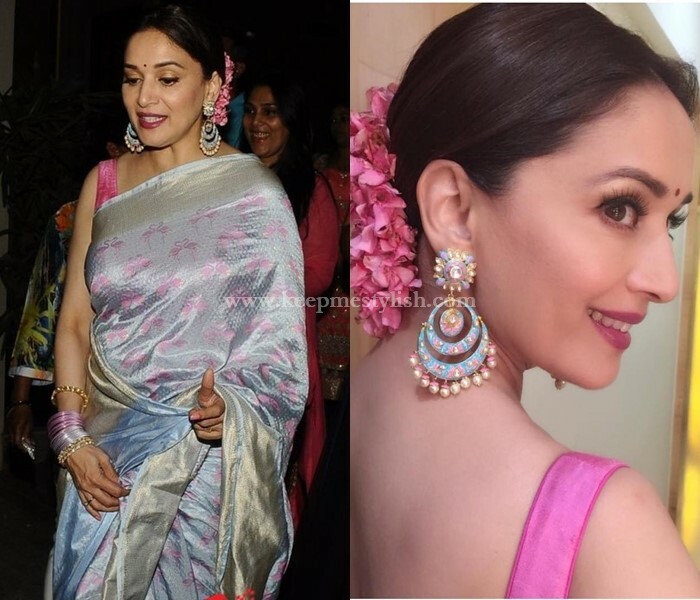 One winning accessory that always makes this saree style work is a bold Jhumka. If you are not a jhumka person, then get a dashing chandbali or other statement earrings that adds charm to your look. While wearing sarees, there are certain things that will never lose its place. Yes, a dark, dramatic kajal applied eyes is something that should be tried with any saree look. This instantly magnifies your face and make it look regal. Get a thick kajal and apply lavishly over the waterline and upper line. Also go for a good coat of mascara to bring the best of your eyes. If you want to add more definition to your face, then smokey eyes can give you that. If the saree you plan to wear is of traditional drapes, then a row of thick jasmine around the bun will add more beauty to your look. Even if you plan to wear designer sarees, still you can go for floral clips or stone studded hair clips to make hair look on-point. Sarees gives us a wide option to deck up the jewellery. Use it wisely to elevate your look. If you wear silk sarees, a bold antique neck piece or kada style bangle would do the needed magic. However, if you opt for designer sarees, then a long silver necklace and statement bangles are enough to round off the look. The options are many. 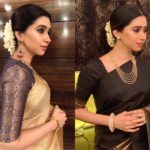 Chose the apt accessories that goes well with your saree. Wearing a saree with sleeveless blouse has been in trend since our mom’s time. And we are no way to stop lusting over this look. 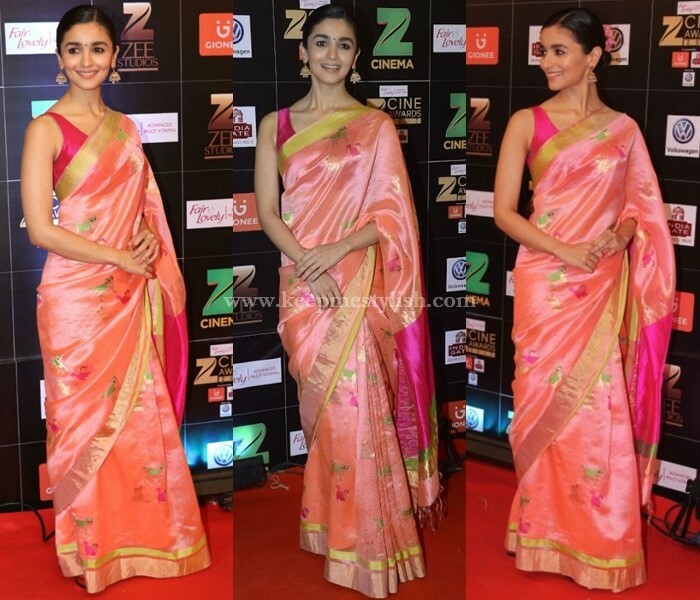 By following these 8 simple rules, you can totally come up with a celebrity approved saree style. To recall the formula, wear your saree perfectly and let it float over your sleeveless blouse. Take your hair for a dramatic bun, make your eyes dark, keep your bindi bold and add right accessories. You are all done and set to steal the show! Now time to tell us your tips for the benefit of our readers. Do you have any specific idea that makes saree with sleeveless blouse so sassy? then don’t hesitate, drop your comments below! 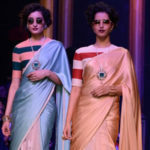 Sarees and Sunglasses – Unbeatable Duo! Next articleEveryday Natural Makeup For Indian Skin : 9 Chic Looks To Try!